Wilmington, N.C., is the site of the L.V. Sutton Power Station — a retired coal-fired power plant operated by Duke Energy along the Lower Cape Fear River. Though Duke recently converted Sutton to burn natural gas, the carcinogenic-laden waste generated from decades of coal combustion remains in 135 acres on site. The largest is Sutton Lake, a cooling pond now managed by the N.C. Wildlife Resources Commission that previously received unregulated discharges from three adjacent coal ash ponds. According to Frank Holleman with the Southern Environmental Law Center, however, the District court of Wilmington ruled last week that Sutton Lake is a Water of the United States, meaning it will no longer be an authorized site for unpermitted coal ash discharges and the adjacent coal ash ponds ponds must undergo frequent inspection. Though I’ve lived the past five years away from home, I am from the Wilmington area. I spent a lot of time as a kid on the Cape Fear River in a boat with my parents. We would idle along, my dad showing me the spots where he used to camp, squirrel hunt and shoot mistletoe from tree canopies along the river. 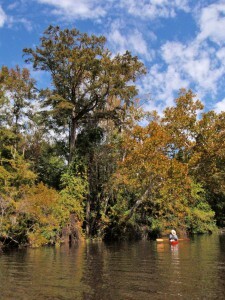 Eventually, I began kayaking to those places, exploring them for myself and venturing further downriver. While I was often surrounded by wild things, periodic sights of clear-cut forests and the distant red and white-striped smokestacks of the Sutton plant reminded me that development and pollution was not far off. At first, I wasn’t aware that I was paddling a stone’s throw from Sutton Lake or the ash ponds. Unlike so many people, I had never been out on the lake; I had only seen the brown recreational boat ramp sign off Hwy. 421 and wondered what it was like. But on one occasion my dad and I were heading downriver admiring the giant cypress trees and we stopped at the river bank where there was a small gap in some pines. We scrambled up the riprap and debris and suddenly I realized what I was seeing — Sutton Lake. Unlike Sutton Station, the lake is hidden by a stand of trees adjacent to the river. Vast and obviously man-made, it seemed such a stark environment; I couldn’t imagine that anyone would actually visit it recreationally — and I didn’t even know about the coal ash dumping there at this point. But people did visit. They still do. Like so many other lakes that serve as illegitimate or unregulated coal ash dump sites, Sutton is a popular fishing and boating site. Why, when it looks nothing like a natural lake with its concrete retaining berms and gravel access roads on top of the berms and is polluted with heavy metals? I didn’t know about the nearby coal-fired power plant and coal ash ponds — and I grew up as a privileged, environmentally aware, English-speaking kid in the area. It’s a large body of water well stocked with bass, bluegill and a variety of other fish; on the surface, it appears normal. That’s my best guess as to why. That’s what Kemp Burdette, the Lower Cape Fear Riverkeeper, shared with my dad, me and other Appalachian State University students during a “source-to-sea” kayak expedition I led two years ago. I was raised on fresh-caught freshwater fish and seafood, and despite having known about mercury levels in some fresh and saltwater fish, I couldn’t turn down fried catfish until Kemp told us that a woman shouldn’t eat catfish from the Cape Fear but once a year, and a pregnant woman — forget about it. At that moment I remember feeling such remorse for all of the people who had catfish lines trailing under low-hanging branches over the river, planning to take their catch home to their families, just as my dad used to do. And that doesn’t even account for the remorse I now feel for people across our state, nation and world seeking and finding their livelihood near coal ash ponds and other toxic waste sites. Today, I know much more about coal ash and the associated threats. That counts for something. Today, my parents live about two miles upriver from the plant and the lake. No longer fishing in that area and having well water, they really aren’t at risk like so many others downriver in Flemmington Road, Navassa, Leland and other rural communities. But they know the risks. That counts for something. There are advocates inside and outside of communities — concerned local businessmen and women, children, parents, elders, hard laborers, fishermen, scientists, doctors and lawyers — that are challenging the corporate status quo and inadequate regulations that fail to protect their drinking water. That counts for something. And finally, our courts have listened and ruled to protect Sutton Lake from unpermitted discharges from Duke Energy’s coal ash ponds. Of course, until the coal ash waste is moved into lined ponds, as required under the new state coal ash law, we’re still left with 135 acres of coal ash ponds at the Sutton site that constantly leach contaminants and are at risk for structural failure. That’s not to mention the 13 other contaminated coal ash storage sites across North Carolina, 10 of which are not prioritized for cleanup under the new law. Prioritization is on the table, however. By December 2015, all coal ash storage sites must have a priority designation — which will determine pond closure and cleanup plans under the N.C. Coal Ash Management Commission’s watch. Maybe the Sutton reclassification as a Waters of the United States is only a small move toward environmental justice, but it gives me hope for the remaining coal ash sites in North Carolina, and more importantly, hope for the marginalized residents that bear witness to the injustice in their communities every day. Jaimie McGirt, a native of Wrightsville Beach, N.C., served as Appalachian Voices' 2014-15 Americorps Education Outreach Associate, with a focus on community work and energy efficiency issues.